More than 60 ISIL suspects in German army, but “right-wing extremists” are the real danger! The German army has said it wants tougher security checks on recruits after admitting that more than 60 Islamists are suspected of infiltrating its ranks. In a draft amendment seen by German newspaper Welt am Sonntag, senior Bundeswehr officials said all applicants should be screened by the intelligence services for jihadist links before they begin basic training. And they disclosed that 64 Islamists are already feared to have embedded themselves within the armed forces, along with 268 right-wing extremists* and six left-wing extremists. Terrorists are attracted to the army because they can use the training to plot future terror attacks in Germany, the document added. The proposals would lead to a major overhaul of the country’s recruiting policy as under the current system soldiers are only checked for Islamist ties once they have enlisted. They would also require an extra 90 military officials to be hired in order to carry out a further 20,000 checks per year. Not to worry. The favorite new explanation: psychological issues. It truly is amazing how a person’s most confidential mental health records can be accessed by the media (or the police) before they even get his name. A man, reported to be of Algerian origin, tried to grab the officer’s gun and it is understood that when he failed, he pulled out a knife, repeatedly stabbing her in the throat. The motive behind the attack is unclear. … the attacker was known to local authorities for having psychological issues. No need to worry about Islam or culture, then. A French police officer has been stabbed by an Algerian man who French media say has a history of violence including attempting to firebomb a synagogue. France: Two men who attacked a young couple for eating a pizza topped with ham have been sentenced to 18 months in prison. The victims left Le Mix Bar, a nightclub in Cambrésis, France, where they had spent the evening, and ordered pizza from a nearby food vendor. They were approached by Boussaid and Bouzid soon after, who offered the young couple cocaine. Noticing ham on the pizza, the two Arabs told the pair they would “go to hell” for eating it. Islam forbids the consumption of meat from pigs. Seeking to humiliate the woman, the assailants caressed her blonde hair and forced fingers into her nose, which caused her to fall and lose consciousness. When her companion tried to protect her, the two Arabs began to beat the young man before security staff from Le Mix Bar intervened. While nearly everyone has expressed an opinion about the burkini ban that was put in place by the mayors of several dozen French municipalities, and then overturned by a decision of the Conseil d’Etat, the views of Jean-Louis Harouel, a French legal historian and polymath, are of unusual significance. Harouel, a professor emeritus of the History of Law at the University of Paris, criticizes the members of the Conseil d’Etat for their decision, which he says reflects their failure to take into account the difficult period that France is now going through. In the present circumstances, writes Harouel, the “jurisprudential liberalism”’ that might have been acceptable in relatively peaceful times can no longer be justified, given what France is enduring. Furthermore, the Conseil d’Etat failed to take into account the fact that France is now engaged in a clash of civilizations, that just in the past year has cost it hundreds of deaths on its own territory, and which made it necessary to maintain the State of Emergency. “Islamism” is now making war on France, and there is no real boundary-line between Islam and Islamism. The Conseil d’Etat failed to take into account the shock felt by the French people on seeing burkinis deliberately appearing on the beaches so soon after terrible massacres had been committed in France by Muslims acting in the name of their god. 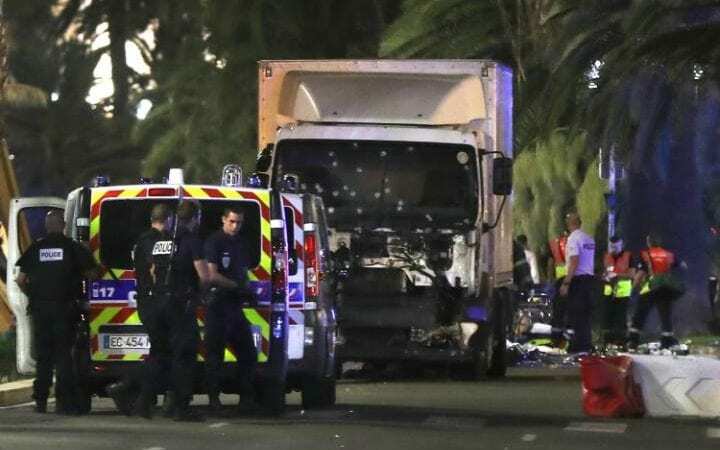 So soon after the carnage on the promenade in Nice and the slitting of the throat of a priest while he was fulfilling his priestly duties, such an increase in the flaunting of Muslim identity is truly indecent. The Conseil d’Etat refused to see that the conquest of our beaches by these burkinis is only one stage in the taking over of France by the forces of political Islam. The Conseil d’Etat refused to see that those wearers of the burkini – like all those who wear variations on the Muslim veil — are the foot-soldiers, whether deeply convinced or merely docile, of a civilizational jihadism which is now trying to conquer our country by stealth. 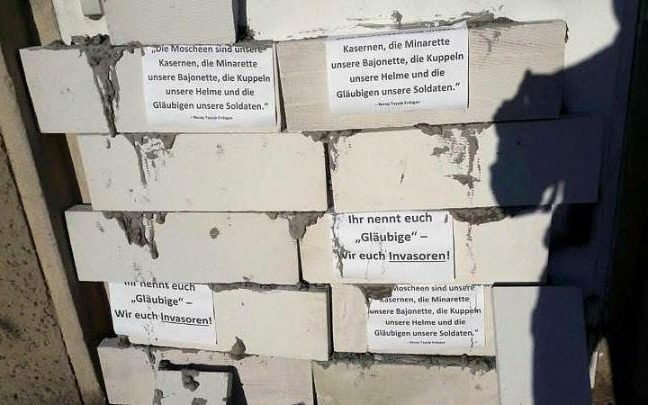 Muslims living in a small town in northern Germany were shocked to find someone had bricked up the entrance to their mosque during the night. Those gathering for prayers last Friday in the town of Parchim found the door to the mosque jammed with concrete breeze blocks, on which crude flyers with anti-Muslim slogans had been stuck. “You call yourselves believers. We call you invaders,” one of the flyers read. Another contained lines from a poem recited in public by Recep Tayyip Erdogan, the Turkish president: “The mosques are our barracks, the minarets our bayonets, the faithful our soldiers”. Police are investigating the incident, which is suspected to be the work of a far-Right group. Indonesia: soldier of allah fails to blow up church, cops severe beating…. An ISIS suicide bomber [Sunday] attacked a Catholic priest with an axe as he tried to blow up hundreds of worshippers at a church during Sunday Mass. Fortunately, the congregation was able to detain Ivan Armadi Hasugian until police arrived. The maniac was found to possess “a hand-drawn picture of the ISIS flag,” and said he was not working alone. A picture of the attacker’s ID card circulating online said he was Muslim. In recent years there have been a number of attacks on religious minorities and others in Indonesia, the world’s most populous Muslim-majority country. No need to investigate. Any moonbat could tell them that Hasugian’s attempt at terror was a desperate response forced upon him by income inequality and neocolonial oppression. More laughs: Presenting Ivan Armadi Hasugian, glorious Soldier of Allah. This means that the allahu-akbaring attacker, French-passport-holding Muslim Smail Ayad, succeeded in murdering two people. PHOTO: Tom Jackson died in the Townsville hospital, a week after he was critically injured. “Home Hill Stabbing: British Man Tom Jackson, Injured in Backpackers Hostel, Dies in Hospital”. ‘A British man who was critically injured in a stabbing attack at a north Queensland hostel last week has died in hospital. ‘Tom Jackson suffered multiple stab wounds to his head and leg when he tried to save Mia Ayliffe-Chung at Shelley’s Backpackers in Home Hill, south of Townsville, last Tuesday night. French national Smail Ayad, 29 (that is: “French-passport-holding ethnically-Arab Muslim Smail Ayad, 29” – CM) has been charged with murder and attempted murder over the stabbings. Mr Ayad, despite his French passport, should never have been permitted into Australia. Had he not been permitted to enter two people – Mia Ayliffe-Chung, and Tom Jackson – would still be alive, who now are dead. But of course, this has nothing whatsoever to do with Islam. A female police officer has been seriously injured after a man attacked her with a knife at a police station in Toulouse, France, local media reported. The suspect reportedly tried to grab the officer’s weapon and when the attempt failed, he took a knife and stabbed her in the throat. A passage from the Koran will be read out at the funeral of murdered British backpacker Mia Ayliffe-Chung. The 21-year-old died after being stabbed to death during a frenzied knife attack at a north Queensland hostel last week that also left fellow Brit Tom Jackson dead, after a week spent in hospital in critical condition. It’s alleged the man charged over the murder, French national Smail Ayad shouted out ‘Allahu Akbar’ as he attacked Mia but police have said they had found no evidence the crime was terror related. The funeral is expected to take place in Ms Aycliffe’s hometown of Wirksworth in Derbyshire with close friends and family. Conservative politicians have seized on the incident to call for a ban on Muslim immigration but Mia’s mother has appealed for people not to misrepresent her daughter’s death. In a blog-post on the UK news website The independent, Rosie Ayliffe says she is planning to include a reading from the Koran in a multi-faith funeral for her daughter in response to media attention given to Ayad’s religion. ‘After talking about the misrepresentation of Mia’s death in the media as an act of terrorism on the part of an Islamic fundamentalist, the minister delivering the service suggested we include a Koranic reading, and he will find something suitable with a friend who is an Islamic scholar,’ she wrote. I bet you 3 silver dollars from my piggy bank that it will be 5:32 without 5:33 of course. As always…. Australia: brave hero dies, Allahuakbaring killer’s behaviour remains unchanged…. A HEROIC British backpacker who attempted to save the life of a young woman in a hostel stabbing frenzy last week has died in hospital. Tom Jackson, 30, suffered more than 20 stab wounds to the face, head and torso as he tried to shield Mia Ayliffe-Chung, 21, from a vicious attack at Shelley’s Backpackers, in Home Hill, south of Townsville last Tuesday night. French national Algerian Muslim Smail Ayad, 29, has been charged with Ms Ayliffe-Chung’s murder, along with the attempted murder of Mr Jackson and another man. One charge of attempted murder will now be upgraded to murder in the wake of Mr Jackson’s death. Witnesses said Mr Jackson attempted to shield Ms Ayliffe-Chung from the frenzied attack only to be stabbed himself in the hostel bathroom. “Mr Norris, who has run the hostel for more than 15 years, told local media the slaughtering went on for hours. “It started just after 11pm and probably went through until 2am, 2.30am,” he told Nine News. THE owner of the north Queensland hostel where a woman was murdered in a stabbing frenzy has revealed the excruciating extent of the torturous attack. NO to racist ban on burkini! Fight sexism! Fight Islamophobia! Several hundred protested at the French Embassy in London against ‘burkini’ bans. Despite France’s top constitutional court bowing to large anti-racist protests and ruling AGAINST the bans, resorts in France continue to support the racist ban. Note how many times they are beating this tired old “racism” canard to death. The demonstration was called by Stand Up To Racism (SUTR) and Muslim Engagement and Development. Protestors demanded “NO to sexism! NO to Islamophobia!”. Until a few years ago, nobody had heard of a burkini. After this summer, it is unlikely many people will want to hear about the garment ever again. The fact that this item of beach clothing has become such a colossal story is deeply telling of the underlying issues of our time: issues not only to do with the present state of Islam, but also central issues with the current state of the West. Unknown (and un-invented) though the burkini was until recently, its emergence says much about the global regression of Islam in our day. Throughout Islamic history, injunctions to “modesty” have been agreed upon, but precisely what forms this should take have varied widely. Nevertheless, from the Middle East outwards there has been a significant regression in recent decades away from all freer forms of female attire. Forty years ago, the burqa was a rare sight in Afghanistan. Today it dominates. In the same way, within the lifetime of most readers the Islamic headscarf was comparatively rare in North Africa. Now it has become commonplace – indeed it is becoming a statement not to wear one. The same regression is happening in Turkey and across Europe. Globally Islam is becoming more puritanical and one of the first signs of this, always, is the suppression of women’s freedom. Of course to even use the word “freedom” in this context is to tread into a quagmire. With the growth of Muslim populations in the West, “freedom” is thrown back at us. Who are free states to say what freedom is? What about the freedom of people to follow the most un-free Islamic dress codes? Those who make these arguments know that Europeans are nervous about how to respond to such claims. France has been at the frontline of this debate for two reasons. First, because it has the largest Muslim population per head of population of any western European country. And secondly, because France’s own secular constitution is more clear-cut than any other country, meaning that these contradictions between Islamic demands and the expectations of the republic collide with considerable regularity. The arguments are now practised. But they are also nuanced. Even the ban on the wearing of the headscarf (and other “conspicuous” religious symbols) in public institutions was only passed a decade ago once French lawmakers realised it was an issue of the freedom of French Muslim women not to wear the headscarf that was at stake and not only the right to wear one. What were the pressures within the Muslim community for women to cover? How could the state know?